Non Stick Broiler Set 12" x 9"
Home > Kitchenware > Cookware > Non Stick Broiler Set 12" x 9"
This two-piece nonstick broiler pan with perforated top allows grease to drain off, while you cook, for healthier results. Measures, 12" x 9" x 1.5"/30.5cm x 23cm x 4cm. 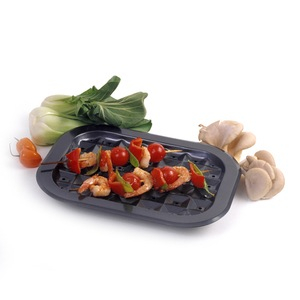 Nonstick finish makes removal of broiled or roasted goods effortless and clean up is easy. Hand washing recommended.